Just about everyone has heard the conception that kids who are sheltered or have felt overprotected throughout their adolescence often experience an exaggerated sense of freedom when they leave home for the first time. Could it be that in actuality they experience an overexposure to new temptations? College is always a new world no matter if incoming students decide to stay close to home or go hundreds of miles away. 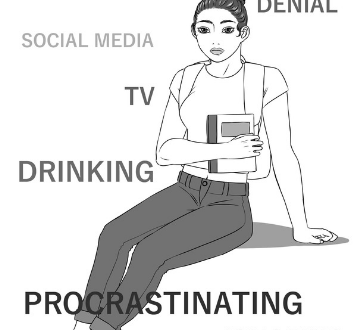 There are several things that students are exposed to in college especially when they are still in the impressionable teenage years. College years, as displayed in the media, is full of bad decisions fueled by excessive partying. Parties may not be the root of the problem. Universities constantly deem to promote safety as a selling point to parents but not everything is preventable. Things can happen on or off campus. There is no way to ensure protection, especially in this day and age. No incoming student has a way of knowing how they will be in college. Everyone has goals and expectations for their undergraduate years but no one can be certain of how much they will change over the course of those four or more vital years in school. The hard truth is that college is the place where most students are thrust into independence which comes with the false need to cope. The most common dangerous coping mechanisms for college students are underage drinking, drugs, sexual activity, illegal activity and more. Even the most well-adjusted students can be succumbing to the temptations presented. Several aspects of the college experience are unpredictable. Each idle weekend is a possibility for incidents to occur. In the best cases, universities combat the peer pressure surrounding students through campaigns for things such as sobriety. APSU is a ‘dry campus’ which means no alcohol is permitted anywhere on campus. Any student caught with alcohol will be subject to punishment. This is surely a breath of fresh air for concerned parents but this is only applicable on campus grounds. There is only so much that university administration can do for student safety. Housing conducts room inspections, drug searches and other procedures. There are counseling services available free for students in the Ard building. These are some of the measures taken to counteract the pressure college students face daily but ultimately it is a test of morality. APSU does a decent job of securing the perimeters of campus but no college can successfully shield students from societal pressures. Things like depression, grief, anxiety and stress are synonymous with college because it is extremely likely that students will come in contact with one or more of these feelings throughout their years of enrollment. It is utterly impossible for any institution to be an entirely safe place for students because safety is relative to the individual’s needs. Everyone needs physical safety from campus police but some people need safety from internal pressures that come with a change of environment. Humans naturally gravitate to where they feel comfortable so a new environment can easily be a traumatic experience. The only way for an institution to accurately promise safety is if they can ensure the emotional and mental stability of students in their environment, which is impractical with thousands of students enrolling each semester.